Posting text and video bilingually to social media sites is possible, but not simple! This is a practical post on posting to social media for audiences that speak more than one language. I work with many organisations in Wales that post bilingually, and I thought this may be helpful. It’s just tips from my own trial and error and I’m aware that it’ll date, as Facebook and Twitter update they way we use them so often. Hopefully any updates will remove some of the glitches and extra steps needed to post in multiple languages. Here’s the gist far as I can see it. I’m only mentioning Facebook, YouTube and Twitter for now (but I’ll look into how people post bilingually on Snapchat, Instagram and Linkedin another day). You can add text in multiple languages on Facebook posts. The reader will see the text in the language that they have set their Facebook to. It’s tricky to add different images to correspond to each version of your text (e.g if you had text in Welsh, you’d want your accompanying meme text in Welsh also). However, it is possible. You can add only one video to your multiple versions of text. Even that is a bit of a faff, instructions are below. You can, however, add multiple language subtitles (closed captioning), which will display in the language the Facebook user viewing the video has set as their preference. A neat and useful way to add captions to Facebook videos is by uploading an SRT file. You don’t have enough room to post bilingually within a tweet, and it doesn’t make sense. There is no option to display your tweet in the language of the Twitter user. You can’t add closed captioning to videos. If you want subtitles, you’ll have to bake them in – by this I mean you’ll have to use some video editing software to add the subtitles manually to the video file. This is a massive pain in the arse. First I upload my video, then I manually create closed captions, by listening to the video, and stopping it and transcribing each sentence. YouTube times it as you go along and it’s very intuitive. This creates an SRT file attached to your video. Or many, if you’ve captioned in multiple languages. (In my case, I transcribe in English and then send the file to my lovely Welsh translator to create a Welsh version). You can download your SRT file to use elsewhere, like on Facebook. Hooray! Go to your video in Video Manager, find the closed captions and there’s an option to download in ‘Actions’. First, enable your Facebook page to let you post in multiple languages. This is the easy bit. The instructions are on Facebook. Write your post text in multiple languages first (when you upload the video first, you don’t get the option for multiple languages). Add links and everything as this will be annoying if you later try to edit (when I go go back after uploading the video, I’m only able to edit the English, not the Welsh). Once you’re happy with the text in all languages, attach your video file. Make sure you don’t publish, hit ‘save draft’. Then when the video has processed, look at it. Click the edit post button, and go to ‘captions’. So if you downloaded from YouTube, then rename your file before you upload it. Now you’re ready to publish. I love Twitter, but when it comes to posting text and video bilingually, it’s not very helpful at all. If you know a way to upload an SRT file to a Twitter video, or to just use the SRT file to add it directly as subtitles in your video file – please let me know! I’ve downloaded so many apps and tried a thousand ways – but I’m stuck with manually adding each sentence into my video in iMovie as subtitiles, which is time consuming and makes me want to drink too much whisky. I remember the workaround – go to Business Manager Page Posts section (business.facebook.com/adsmanager/pages) and click create post. After entering the multilingual text, add a picture first. Then drag and drop or upload a video. Then delete the picture and you should be able to publish the video with the multi languages. Hey Carl, thanks so much for this tip! I had a go, but there seems to be only an option for targeting the post at two languages, but not actually posting bilingually. Am I missing something? Hi, that’s a great workaround, but there’s no need to do it from Business Manager. From the Publishing Tools section of your page, you first write in all the languages you need, then upload the picture, then the video, remove the picture, done. 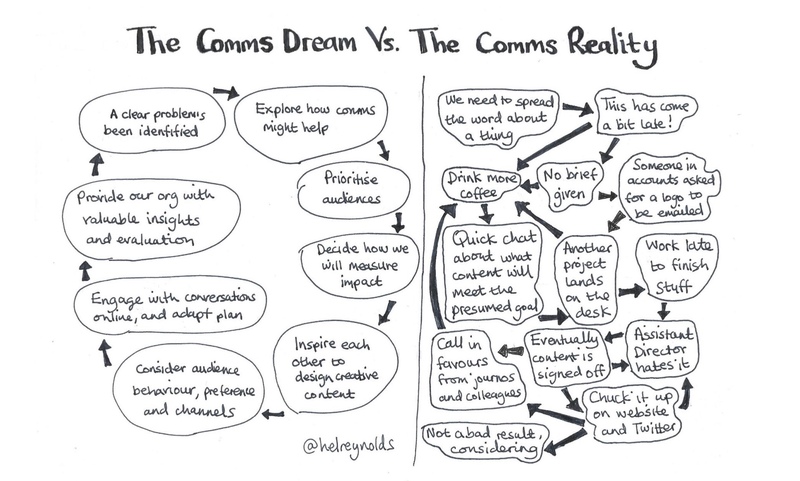 Previous The comms manifesto – will you sign up?